A four bedroom detached house, completely refurbished and with driveway parking and front and rear landscaped gardens. 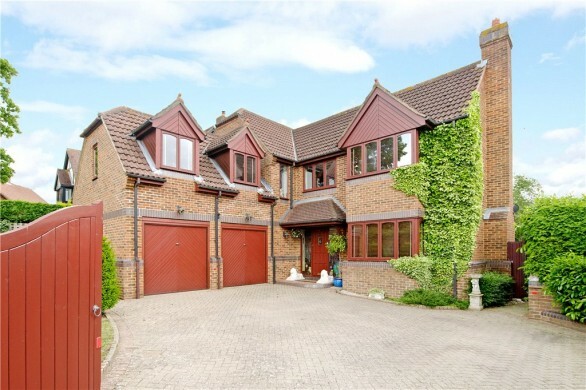 This remodelled property has accommodation including a sitting room which is open plan to a kitchen/dining room, a playroom and a utility room. One of the four bedrooms has an en suite bathroom and there is also a family bathroom. The front and rear gardens have been professionally landscaped, with the rear garden having two decked areas. There is driveway parking for up to four cars. A solid wood door with a glazed side panel opens into the entrance hall. This has stairs to the first floor with a store cupboard under, and a limestone floor which continues through to the kitchen/dining room. The cloakroom is fitted with a wash basin on a teak Fired Earth vanity unit, and a WC. The sitting room is open plan to the kitchen/dining room. It has a wall mounted Mors&#248; wood burning stove with a glass hearth, a window to the front, and solid oak flooring. 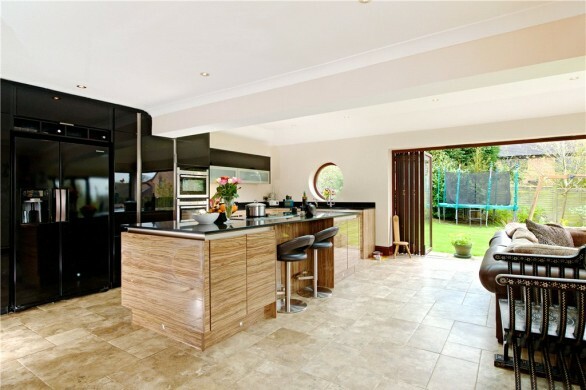 The kitchen area is fitted with a range of white gloss fronted cupboards and soft close drawer units. There is an island unit fitted with soft close drawer units to one side and cupboards to the other, a stainless steel Kohler sink with mixer tap on a solid Silestone worktop, an integrated Indesit dishwasher, and a De Dietrich induction hob. There are two De Dietrich electric ovens and a full height fridge and a full height freezer. The dining area has two sets of bi-fold doors opening to the rear deck. The playroom has an engineered oak floor and French doors opening to a covered deck. The utility room has two full height cupboards housing the boiler which powers the central and underfloor heating. The cupboards also provide storage. There are a range of grey fronted wall units, oak worktops and a stainless steel sink with a mixer tap. There is also an integrated microwave, space and plumbing for a washing machine and tumble dryer, and a porcelain tiled floor. The master bedroom has floor to ceiling windows and a door opening to a balcony. There are built-in wardrobes and an engineered oak floor. The en suite is fitted with a double walk-in shower, a freestanding William Holland tin dipped copper bath with mixer tap, a wash basin on a teak Fired Earth vanity unit with storage under, and a WC. There is a window to the front and a porcelain tiled floor. Bedroom two has a built-in wardrobe, an engineered oak floor, and a window to the rear. Bedroom three is to the front of the house and has an engineered oak floor, while bedroom four - which is to the rear - is currently used as a study and also has an engineered oak floor. The family bathroom is fitted with a double walk-in shower, a freestanding bath with mixer tap, a wash basin on a vanity unit with storage, and a WC. There is a window to the rear and a porcelain tiled floor. To the front of the property two full height doors open to a storage area. The landscaped front garden is planted with a variety of trees and has gravelled parking for up to four cars behind an electric sliding gate. 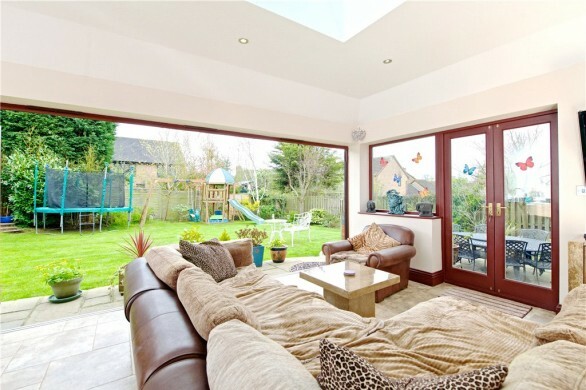 There is side access to the landscaped rear garden which has a decked area accessed from the dining room and a covered deck area accessed from the playroom. There is a further decked seating area to the furthest end of the garden. There is also a lawn area, raised beds, a variety of mature trees and shrubs, a garden shed and an outside tap. The Buckinghamshire village of Woburn Sands has a high street with GP and dental surgeries, shops, restaurants, pubs and a bank. There is a monthly farmers&#039; market held on the village green. There are two schools in Woburn Sands - Swallowfield Lower and Fulbrook Middle - and a daily bus service to Bedford, Thornton and Akeley Wood schools. Select a date and time If you would like a viewing sooner, or to talk to a member of our team before requesting a viewing, please call us on 01908 586400. If you would like to get in touch with us or have any questions regarding this property, please click the button below. Don't miss out! Keep informed of all our latest properties as they come to market with us. There has never been a more critical time for your finances to be organised. That's why a free financial health check from Michael Graham estate agents could be the start of a brighter financial future.